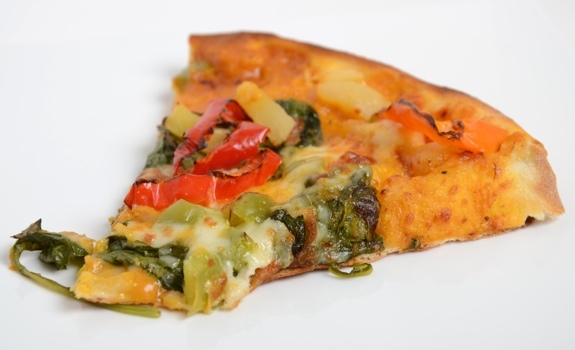 Vegetarians are used to limited pizza choices. In a pizza party setting with only a token vegetarian or two, a sympathetic host will either order a “vegetarian” special (tomatoes, peppers, mushrooms, maybe olives, etc.) or a cheese pizza. It’s always the same. Granted, vegetarians have their own secret orders (I discovered pineapple and onion while flirting with vegetarianism many years ago, and it remains a favourite), but rarely is there a vegetarian pizza option that is both exciting and downright out of the ordinary. 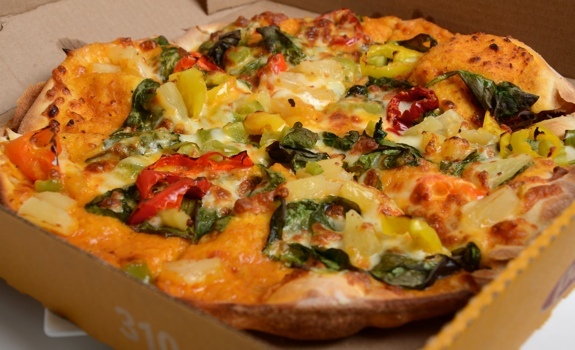 Enter Panago’s new Veggie Korma Indian pizza, which takes one of the world’s great vegetarian cuisines and combines it with North America’s cheese-covered home-delivery food of choice. This pizza sounds amazing. The Taste: Sweet and spicy, but not creamy in the way I expect korma to be. The korma sauce isn’t spectacular, and the spinach threw me off. The pineapple worked with the spice, and the banana peppers added some heat, but it doesn’t feel quite balanced enough. Certainly OK, and a great alternative to the standard “vegetarian” pizza options, but not something I’d order again unless a veggie friend was coming over. 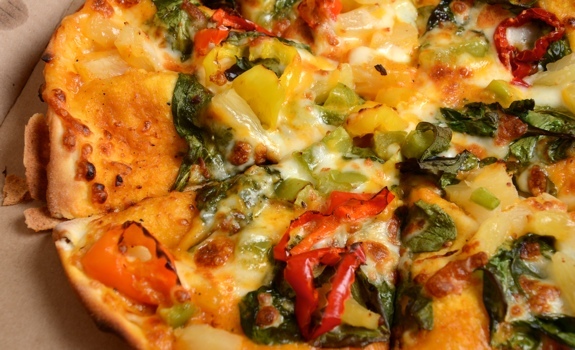 A slice of Panago Veggie Korma Indian pizza. Cost: $10 for a small, $12 for a medium, $14 for a large (before delivery or tax). Value for cash money: Good. The larger, the better the value. Nutrition? : Couldn’t find any nutritional info on the Panago website. The verdict: An interesting flavour experiment. OK, but not as good as I was hoping. Too bad it was disappointing. It looks great though. Gotta give it to panago for making an effort. Agreed. I was really hoping it would be better, especially since their butter chicken pizza was quite yummy. If they fixed the korma sauce, I’d be a happy camper. I love the Veggie Korma Pizza! So much I’ve made my own, added a few extras and can say this is my favourite pizza of all time. I’m not vegetarian anymore, but will still order this pizza any chance I can have it!